Love at first sight? You bet! 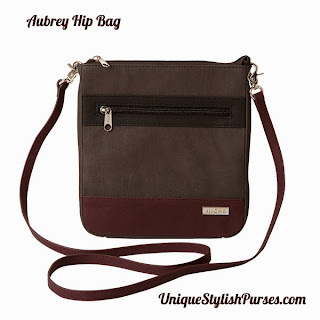 This Aubrey Hip Bag carries so much—and you’re going to love that—but it’s her gorgeous color scheme that really captures your heart in earnest. Deep charcoal grey faux leather is complemented by purple and black details on the front and back. And just imagine all you can carry in the front zippered pocket! She’s a little Hip Bag that can do big things for you. Zipper closure (silver hardware) with black fabric-lined interior and matching long purple handle. Bag is completely self-contained—it is not interchangeable like our traditional bags. Dimensions: 8 ½” tall x 8” long, with a 1” gusset; handle is 54” long x ½” wide with a 25 ½” handle drop.